In Greece, on Monday is the day the season of great Lent begins and marks 40 days before Orthodox Easter. It is called Clean (or Pure) Monday as people are called to clean their hearts and minds and start a righteous way of living. On that day, which is a public holiday, tradition and religion has it that people should only eat shellfish and fasting foods and continue to do so until Orthodox Easter Sunday. Since I am from Greece , I thought to take the opportunity this week and share with you a recipe that is very quick and super-delicious and at the same time follows my country’s religious tradition. All you need is prawns, a glass of good whisky and your cooking apron. Let’s cook! In a saucepan, over medium heat, put the olive oil, the clove of garlic and prawns and shizzle for 1-2 minutes. 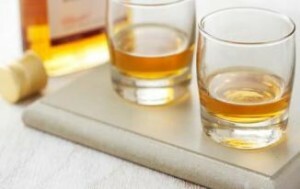 Pour in the whisky and let it boil for a minute for the alcohol to evaporate. Add the chopped tomatoes and the tomato paste and let them cook for 3-4 minutes. Remove the prawns from the pan and set aside. Season the sauce with salt and let it cook for extra 5-10 minutes until it thickens. When the sauce is ready, throw away the garlic clove that was cooking in the sauce and combine the prawns into the sauce. Season with pepper and serve hot. Boiled wild rice is ideal to serve with this dish, as is a green salad with a delicate balsamic vinegar reduction and olive oil dressing. Don’t forget to bring bread on the table to savour any remaining sauce from your plate! Shelled prawns can be a bit tricky to eat. 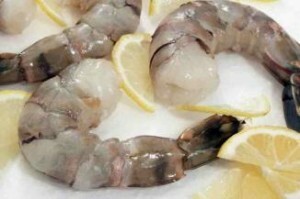 If you are not a big fan, you can use unshelled prawns. You can use frozen prawns also to make this recipe, just remember to defrost them by putting them in a bowl of fresh cold water for a few minutes. The taste of the dish will not be as intense but it will still be delicious. If you cannot get hold of ripe tomatoes, you can use canned tomatoes that you have previously chopped using a blender.